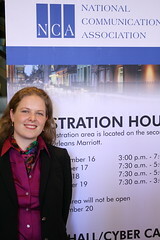 Today Meta-Activism Project Executive Director Mary Joyce was invited to be a respondent on the panel “Voices of the 2011 Revolutions: The Impact of Communication Technology in Tunisia, Egypt and elsewhere in the Middle East and North Africa” at the annual conference of the National Communication Association in New Orleans. The papers presented included a look at information flows during the Tunisian and Egyptian revolutions, a literature review on citizen journalism, an analysis of how the 2005 WSIS meeting in Tunis laid the groundwork for the Jasmine Revolution, a look at how political cartoons were used in the Egyptian Revolution, and a description of how the Tunisian media environment was transformed between the Gafsa protests in 2008 and the Jasmine revolution in 2010. In her response Mary noted that all the papers were attempting to describe the effect of the newly networked transmedia information environment on political power. Panelists had described interaction between a number of different media makers and transmission of content across a range of platforms. Citizen activists in different countries are working together: Brazilian cartoonist Carlos Latuff had direct contact with the Egyptian activists whose revolution he was depicting. Mainstream and citizen journalists are collaborating: they worked together to unravel the death of Ian Tomlinson during the London riots. Information flows between broadcast and social media are ever more frequently: Al Jazeera plucked their video footage of the Jasmine Revolution from Facebook. Beyond individual anecdotes, to what extent can we describe the function and implications of this networked media environment? To what extent do we understand its effect on power? Certainly the networked media environment is an “emergent phenomena,” but how can we as scholars look at these changes in the aggregate in order to understand their aggregate effect on power?